The term, “heresy”, comes from Latin and Greek words, meaning, “school of thought” and “to seize, choice”. The Church teaches that “heresy” refers to teachings that are in obstinate denial of the Truth of Jesus Christ as taught by the Catholic Church (CCC 2089). The first heretic, Satan, taught Adam the “Original Heresy” which promised that Man could be “like God, knowing good and evil” (Gen 3:5). Today, the world has a contagion of false teachings and teachers, supporting heresies of the past (e.g. the child sacrifice of abortion, the perversion of homosexual behavior, false idols, New Age Gnosticism, false Christianities, secularism, etc.). Satan, the father of lies (John 8:44), is at the center of these false “schools of thought” that encourage the “choice” to revolt against the Truth of Jesus Christ. The Church, still guided by Jesus Christ the Divine Rabbi, is in a time of renewal and return to the true teachings of Jesus Christ as evidenced the call to learn of Catechesi Tradendae (On Catechesis in Our Time), the publication of The Catechism of the Catholic Church and the call for the New Evangelization. Jesus Christ is the Divine Rabbi (Teacher). He is Divine, the “Son of God” (Luke 1:32), and the Rabbi (Hebrew, rab, meaning “great”). Jesus acknowledges His role, saying, “You call me Teacher and Lord; and you are right, for so I am” (John 13:13). His whole life is “continual teaching” (CCC 561) for Jesus Christ is the Divine Rabbi. Jesus was recognized as a Divine Rabbi among the Jewish people and leaders (CCC 581). At 12, Jesus amazed the rabbis in the Temple (Luke 2:46-47). His primary title with His disciples was “Rabbi” or “Teacher” (John 1:38; Mark 4:38). He goes “about all the cities and villages, teaching in their synagogues” (Matt 4:23; 9:35; 11:1; Mark 6:2) and in the Temple (Mark 14:49). His teachings “astonish” the crowds (Matt 7:48; 22:33; Mark 1:22; 6:2). He is recognized as a great teacher by the scribes/Pharisees (Matt 8:19; 9:11; 12:38), the chief priests (Luke 20:21) and the Sadducees (Matt 22:23-24). After the Resurrection, Mary cries, “Rabboni”(John 20:16), underscoring the Jesus’ eternal role as Divine Teacher. Is Divine Wisdom – Jesus Christ is the “Word” who is with God since the beginning (John 1:1-2) and is Wisdom personified (Isa 55:10-11). The Greek for “Word”, is logos, which also means “logic or reason”. Jesus is the Wisdom that God has given Man (1 Cor 1:30) and so, is the ultimate definition of Truth. 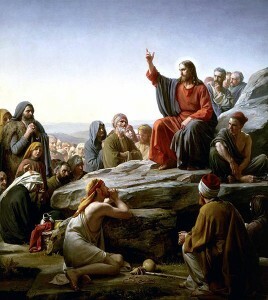 Has absolute teaching authority – Jesus claims the ultimate authority to teach, saying: “My teaching is not Mine but His who sent Me” (John 7:16). Jesus surpasses Moses, not by abolishing the Law, but by reinterpreting Moses’ teaching and fulfilling it (Sermon of the Mount: Matt 5-7; John 6). The Good News of Jesus’ Incarnation is eternally unique. The disciples ask, “Lord, teach us to pray’ and Jesus teaches them the ‘Our Father’ (Matt 6:9-13). The crowds were astonished by Jesus’ superiority for “He [Jesus] taught them as one who had authority, not as one of their scribes” (Matt 7:28). Teaches all people in all places – Jesus teaches people across: genders (e.g. Apostles, Mary and Martha), ages (e.g. Nicodemus, an elder, the Rich Young Man, little children), races (e.g. The Gentile Centurion, the Samaritan woman), wealth levels (e.g. Zacchaeus, hungry crowds) and education (e.g. Nicodemus, Peter). Jesus teaches in the Temple, on a mountain, by the sea, synagogues, villages and towns across the Holy Lands. He teaches individuals and large crowds. Intimately knows His audience – Has complete insight into the hearts and minds of people (John 2:23-25). From growing up in rural Galilee, Jesus has an intimate knowledge of daily life including Jewish cultural values (e.g. Love, hope, faith, truth, righteousness, trust, forgiveness, friendly, communal) and daily lives (e.g. planting, shepherding, fishing, carpentry, landlords, kings, etc. ), giving Him powerful ways to relate to the people. Uses sophisticated teaching methods – Jesus uses Greek rhetoric tools (e.g. a fortiori, reductio ad absurdum) and traditional Jewish rabbinical methods (e.g. Peshat, Remez, Drash, Sod). Jesus uses deductive and inductive logic. He uses fact-based arguments (John 5:31-46). He uses questions and dialogue (Matt 16:13). His teaching includes theological (e.g. Bread of Life) and practical applications (e.g. teaching on adultery/lust and anger). Uses creative ways to engage – Jesus is often cryptic, leaving His audience hungry to understand (John 5:17). Jesus draws on history (Matt 12:2) and tradition (Matt 15:2). He incorporates healing miracles to correct false teaching (John 5:1-17; 9:1-41). Uses various communication approaches – Jesus teaches uses sermons (e.g. Sermon on the Mount), interactive question and answer (Matt 16:13), debate (e.g. Jewish leaders) and story telling (e.g. parables). He can be gentle (e.g. Raising of Jairus’ daughter) and purposefully harsh (e.g. The Woes to the Pharisees, “Get behind Me Satan”). Uses powerful literary devices – Jesus uses literary devices that are vivid, memorable and repeatable. He offers “sound bites”/aphorisms (e.g. casting pearls before swine, seek and ye shall find, etc.). Uses commonplace imagery in provocative ways: mustard seed (Matt 13:31); yeast (Luke 13:20-21), treasure hidden in a field (Matt 13:44), etc. Incorporates parables that offer various levels of spiritual richness that are enduring and endearing and have memorable characters: The Good Samaritan, The Prodigal Son, The Vine and Branches. Teaches through experience and by His actions – Throughout the entirety of the Incarnation, Jesus Christ “orchestrates” the teaching of His Revelation: His Baptism, The Feeding of the 5000, Walking on Water, Transfiguration, Washing of Feet, Last Supper, Passion, Resurrection and Ascension. His miracles teach (e.g. acceptance and care of lepers). Jesus preaches self-sacrifice and does it. Jesus teaches specifically so that His followers and disciples can copy his example (Matt 10:24-25). Corrects the false teachers – Though only a carpenter’s son (Matt 13:53-56) with no rabbinical pedigree, Jesus corrects the errors (CCC 581) of the Jewish leaders (e.g. chief priests, scribes, Pharisees, Sadducees: Adulterous Woman (John 8:2-11)). Jesus’ superior teachings are so decisive, that after the Jewish teaching elites tangle with Jesus, they no longer “dared to ask Him any question” (Mark 12:34). Passes on His teachings to the Church – Jesus anticipates heresy, saying, “many false prophets will rise and seduce the many” (Matt 24:11, 23-26). To protect against heresy, Jesus establishes the Church on the rock of Peter (Matt 16:18) and the Magisterium ensures that the Truth of Jesus is faithfully and accurately passed on today (CCC 88). Continues to teach with the Holy Spirit – Promises that the “Holy Spirit will teach you in that very hour what you ought to say” (Luke 12:12; cf. John 14:26). Jesus ensures that His teaching will continue, saying that “the Counselor, the Holy Spirit, who the Father will send in My name, He will teach you all things, and bring to your remembrance all that I have said to you” (John 14:26). Teaches through all catechists today – In catechesis, “Christ, the Incarnate Word and Son of God…[is] alone who teaches – anyone else teaches to the extent that he is Christ’s spokesman, enabling Christ to teach with his lips” (CCC 427).